Today, the Grafton Cemetery is an historical monument that provides a unique opportunity for area visitors to learn about early pioneer settlement and Grafton’s human history. It serves as a cultural legacy to the many families who are descendants of Grafton settlers. The Grafton Heritage Partnership (Partnership) entered into a cooperative management agreement with the Bureau of Land Management so that the Partnership could manage the site. The agreement allows the Grafton Cemetery 1862-1924 Partnership to improve existing site conditions, install interpretive signage and maintain the site. Over the years the Grafton descendants have maintained the site. Of concern to the Partnership and descendants is that not all the people buried in the cemetery are acknowledged and the current condition of the headstones. We want to preserve the historic character of all of the remaining headstones as much as possible. The Partnership has discussed alternatives that have included stabilizing existing headstones, installing small plagues, replacement replicas and photographic documentation of individual headstone inscriptions to preserve the information as well as considering adding more dirt mounds to mark more grave sites. Another option is to have a list of everyone buried in the cemetery on the gate. Ron Morris a Partnership board member has done research on who is buried in the Grafton Cemetery and has a list of 86 names. This information has come from existing local and state records and from talking with families. However, some of the graves are unmarked and without a dirt mound that helps identify a grave location. If anyone knows a name of person in an unmarked grave or has information on who added the dirt mounds please let us know. Based on visual observation there are 70 dirt mounds which doesn’t account for 86 individuals. There are two rows that don’t have mounds or headstones and it is unknown how many people are buried in that area of the cemetery. The Partnership decided to raise funds to complete a survey of the cemetery using ground penetrating radar to survey the places in the cemetery that don’t have mounds. The radar survey is similar to an x-ray and can detect subsurface images ten feet down such as skeletal remains or other items that may have been placed in a gravesite. This will assist in identifying any potential grave sites prior to placement of any additional dirt mounds. You have all seen the five large white Gibson family headstones in the cemetery. If anyone knows what year and who made the headstones please let us know. If anyone has any pictures of the complete inscriptions of Gibson family headstones or other headstones please send us a copy. The George Jethro Gibson headstone is the last white headstone in the first row that recently broke in two and we are discussing what would be the best way to restore it. We are raising funds to hire the Arid Land Consultants to do continuing maintenance of filing the voids and cracks in the exterior adobe walls of the Schoolhouse and the Russell Home. They will also finish the inside of the living room walls of the Russell home by applying a three coat pioneer plaster matching the original color, texture and hardness. They will manufacture missing window trim and baseboards in the living room. Please contribute to this worthy cause. On November 1, 2008 at 10 am the Zion Canyon Visitors Bureau and the Town of Springdale are sponsoring a 10 K run and 5K walk from Springdale to Grafton to raise finds for the Grafton Heritage Partnership Project. You must pre-register on-line at www.runnercard.com. For more information contact the Town of Springdale at 435-772-3434. www.springdaletown.com/butch_cassidy.hml. Youth groups came to Grafton to do some service projects. Dale Johnson and his group have kept the weeds down at the cemetery. Another group cleaned out the school house and washed windows on buildings. In addition 25 young people and their Dads came from Bloomington Hills 5thWard of the LDS Church and oiled wood on the wooden Berry Fence at the cemetery and the Russell home porch and did some weeding. We have had problems with kids going out to the town site and breaking down the doors and windows. Todd Gabler who owns property next to Grafton installed video cameras at the cattle guard as you enter Grafton to deter vandalism. The camera does capture the license plate so we can investigate vandalism and it appears to be working. Individuals have been apprehended and citations were issued in at least two of the incidents. 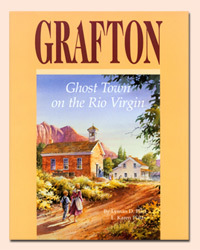 Descendants of Grafton will hold their annual Grafton Reunion, September 27th, 2008 at the town site from 12-2:00 PM. Everyone is welcome. Bring your lunch, hat and chair and memories to share. The Partnership will have items to sell to raise funds for the Grafton Project such as books, pictures of Grafton and t-shirts. If you want to donate an item bring it with you. There will be a program and if you have any stories you would like to tell about Grafton or a song to sing please call Lou Graff at 702-649-7155 so he can put you on the program.